Landice E9-90 Elliptical with Cardio Control Console - Manufactured to exceed commercial leading standards, the Landice E9 ElliptiMill® is quite possibly the most over-engineered and over-built machine around. The amount of quality that has gone into the design and manufacture of this machine is stunning. 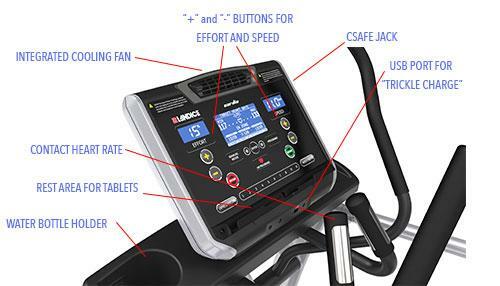 It is one of the most durable and safest ellipticals on the market. The E9 accommodates any fitness level with easy entry and one of the lowest step-up heights in the industry.This machine features the ultimate in accessibility, just grab the handrails, step in, and start exercising with confidence. Its unique center-drive technology enables you to exercise in an upright position which replicates the natural stride of outdoor running motion with zero-impact reducing stress on the back and the knees. The Landice E9 Commercial Elliptical offers multiple and varied workouts with just one machine. Stand upright on the frame’s stationary platform and isolate your workout to strengthen your upper body using the machine’s variable resistance settings. This machine is designed to satisfy light commercial and club applications. Its footprint is 20% smaller than competing models to fit better in your cardio zone. 11" diameter flywheel, 20 lbs. NOTE: Warranty eligible for commercial settings ONLY. Warranty service labor claims outside of a 60-mile radius from the nearest manufacturer-authorized service provider may incur additional trip charges. Metabolic-equivalent speed indicator - An advanced algorithm calculates your metabolic-equivalent speed based on your effort level and pedal speed. For example, if you can exercise at a metabolic-equivalent speed of 11 MPH on the Elliptical, you are capable of running 11 MPH outside. Enjoy all the internet has to offer with the Landice Tablet Bracket. This proprietary adjustable clamp securely holds your iPad, Android tablet, or electronic reader in the perfect position for surfing the internet or viewing your favorite digital content. Mount and dismount your digital device is a snap with our adjustable bracket which holds between a 7" to 12" device. This option has a 1-year warranty. *Electronic tablet NOT included. Looking to make a bulk purchase of cardio equipment for your fitness training center or commercial gym? Contact an IRON COMPANY® fitness equipment specialist today at 1-888-758-7527 or email quotes@ironcompany.com.